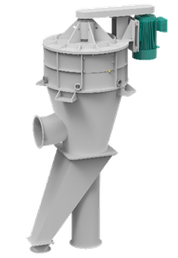 High speed turbo-classifiers are used to separate dry powders based on particle size, delivering throughputs and finenesses that cannot be achieved by screening. ECUTEC’s turbo-classifiers can handle rates as high as 50 t/h and deliver products as fine as 1 micron. ECUTEC provides turnkey classifying systems that offer unparalleled performance in capacity, fineness, durability and value. 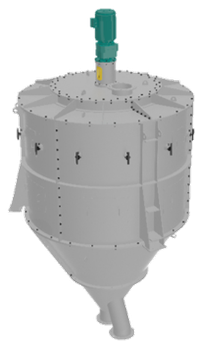 ECUTEC’s array of high speed turbo-classifiers include the SCIROCCO, BORA and MISTRAL lines. For coarser cuts ECUTEC offers its MONSOON line of “whizzer” style classifiers, a relatively inexpensive standalone unit that requires no external air handling equipment. The ULS is ideal for de-dusting, and is often used ahead of screening equipment to reduce nuisance dust and improve screening efficiency.